While I tend to splurge on facial oils and antioxidant treatments, my budget for face cleansers is much more conservative. Spending more than $25 on a cleanser (which doesn’t stay on your face very long) simply pains me. So, it’s out of line for my skincare philosophy (and budget) to spend more than that on a cleanser. 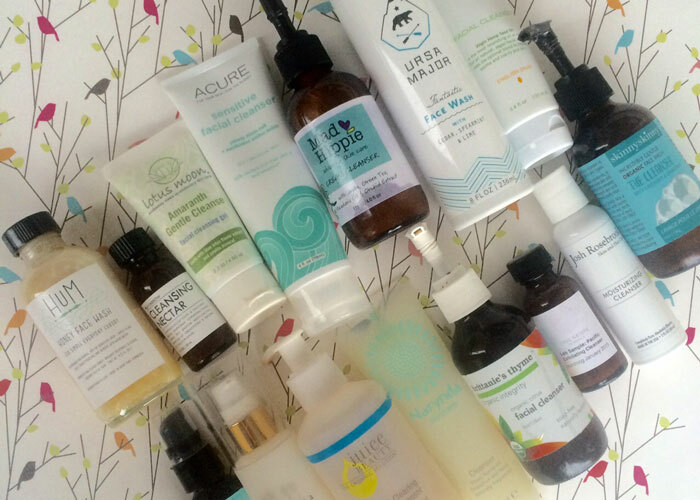 While I have marked a few repurchases below that cost more than my $25 preference, you’ll see that many of my tried-and-true favorites cost way less than $25 (and are easily accessible at your local health food store or even Target!). These are the ones I constantly recommend to friends, family and readers who are interested in cleaning up their beauty routines, and these are the ones I purchase for myself. Designed for dry and sensitive skin, Acure Organics Sensitive Facial Cleanser delivers a relaxing, soothing blend of organic argan oil, coconut oil, olive oil, vitamin E and pumpkin seed oil to hydrate and gently cleanse the skin. Probiotics give fussy skin additional nutrients and balance. Acure Organics pretty much always blows me away with its affordable, certified organic, cruelty-free products. This cream cleanser is also scent-free, which makes it perfect for those who have truly sensitive skin or are experiencing reactions or irritation from switching up their products too much (ahem). The texture is of medium creaminess — very easy to spread, but not runny at all. I love using this with a konjac sponge in the morning. This gentle, soap-free formula cleanses and treats skin with nourishing aloe and vegetable glycerin to help maintain the skin’s acid mantle. Jojoba oil adds additional moisture while witch hazel, grapefruit and rosemary deep clean and prevent breakouts. I love that this cleanser is certified USDA organic yet extremely affordable and, bottom line, effective. That’s green beauty done right. Everything about the Frank Body line is so well-done — and that includes this Creamy Face Cleanser. This creamy cleanser is made with charcoal and targets impurities while nourishing your skin with coconut, grapeseed and sweet almond oils. I love that it’s fragrance-free, yet full of wonderful oils, butters and extracts that cocoon the skin with every little cleansing massage. That includes herbs such as marshmallow root and echinacea, which help cool, soothe, and softening the skin while. I’m drawn to Juice Beauty’s Cleansing Milk during my morning shower. It’s creamy and feels almost like a moisturizer as I massage it onto my face, and it rinses away easily while leaving a light balmy layer of protection on my skin. Mad Hippie is one of those brands that constantly blows my mind. Awesome packaging. Awesome ingredients. Awesome pricepoint. I am constantly recommending this line and this cleanser to those looking for an easy transition into nontoxic beauty, and for good reason: Mad Hippie is the real deal! The Cream Cleanser is lovely to use with a konjac sponge in the morning. The formula is thick and creamy, but easy to spread and feels almost like a light lotion on the skin (thicker than Acure Organics mentioned above). This is thanks to sesame oil, coconut oil derivatives and shea butter — not too heavy, not too creamy, but just right. Mad Hippie’s Cream Cleanser is housed in a glass pump bottle, making it easy to recycle or reuse (major bonus points!). Certified USDA organic and designed for “teen skin” (I hate that language, by the way — I’m in my 30s and experience breakouts), MPWR’s Gentle Cleanser lightly exfoliates thanks to papaya and lemon peel while softening with argan and sunflower seed oils. A base of aloe spiked with chamomile and arnica provide a healing touch. I like the light, refreshing, citrus scent of this cleanser and just how gentle it really is. One of the most interesting textures I’ve experienced, Naturally Lindy’s Facial Wash drapes my skin in a dense cloud of cream to break down makeup, dirt and oils without stripping the skin. It’s texture is somewhat gel-like, while staying within the milky, creamy category. It’s just got this density to it that many creams do not. It almost mimics what a balm or wax could feel like without being that heavy — which makes it lovely as a cream cleanser. This dreamy, creamy, vitamin C-packed cleanser is comforting for everyday use. I like to use it with a konjac sponge in the morning for a gentle cleansing massage. Its base of chamomile flower water, coocnut oil, olive oil, jojoba oil, glycerin and aloe make it soft and soothing for tired skin. Herbs and extracts like green tea, nettle, calendula, chickweed and slippery elm put sumbody’s formula right up there with luxury brands — but at a more affordable cost. You know that sweet compliment I gave Mad Hippie and Acure Organics ? Same goes for The Wonder Seed. This is yet another line that sources high-quality ingredients yet keeps its prices within reach, making it perfect for those new to green and figuring out their favorites as well as those who are budget-conscious or have different philosophies when it comes to what they will spend on certain skincare items. The Wonder Seed’s star ingredient is hemp seed oil (yes, hemp seed is the wonder seed! ), which means that this everything in this line is incredibly moisturizing, including its facial cleanser. The texture of this face wash is a bit more dense compared to Mad Hippie; I would say it’s a similar texture to that of Acure Organics’ Cream Cleanser, though a bit slicker. It works well with a konjac sponge and leaves skin feeling hydrated without any films or residue. If you’re sensitive to scents, do know that the English Daisy scent in this cleanser is present — though to my significant other and me, it smells more like a minty scent (I spy peppermint extract toward the end of the formula). It’s not overpowering, but it’s definitely detectable. Need hydration and blemish-blasting? This cleanser is for you. Blissoma Solutions Mild Rice Facial Cleanser’s smart combination of moisturizing oils (sunflower oil, coconut oil, apricot kernal oil, hemp oil) and acne-busting ingredients (willowbark extract, lavender, frankincense and rosemary) makes it ideal for transition skin — or skin that just can’t decide its classification. Litsea cubeba and palmarosa tone the skin while providing additional antiseptic to keep your pores clean. A slippery skin treat, Cultivar’s gentle cleanser feels like an oil but rinses clean like a gel. It doesn’t lather or soap up, but instead dances around your skin, removing dirt, oil and makeup along the way. At first use, I wasn’t sold on it — until post-cleanse, when I experienced how soft, balanced and clean my skin felt. If you have combo / oily skin, you could easily wash and be done after using this cleanser because of how balanced it leaves you feeling. My only issue with this cleanser is just how slippery it is. You have to make a concerted effort to pump the cleanser into your hands and immediately get it onto your face without spilling any. This is the ultimate sensitive skin cleanser. Josh Rosebrook’s Moisturizing Cleanser is slippery and gentle, keeping your skin’s acid mantle balanced while kindly cleansing away the day. The aloe base makes this cleanser extremely moisturizing, while ingredients such as African black soap, honey and white willow bark work to keep acne at bay. Organic oils of olive, jojoba, evening primrose, sunflower, sea buckthorn and offer a powerhouse of hydration. This is one of those cleansers that’s out of my typical price range, but I love it so much and reserve it for when my skin needs some extra TLC. I like to massage this into my skin — using it with a konjac sponge will cause you to lose too much product to absorption. With an ingredients list that features co-op grown moringa, wildcrafted prickly pear and probiotics, KYPRIS’ Cleanser Concentrate is a lovely morning cleanser that gently cleanses and comforts the skin. It’s wonderful with a konjac sponge or just fingers massaging in the treatment-like cleanser. The jar packaging isn’t ideal, especially for a cleanser I want to keep in the shower; would love to see this one repackaged. In Fiore’s Treate Cleansing Emulsion is just that — a treat — to use. This decadent, milky emulsion is made with always-soothing aloe vera, rose water and nine herbal infusions. It has the subtlest hint of jasmine blossoms. It’s absolutely divine layered atop your favorite cleansing oil for a deep, moisturizing cleanse (In Fiore makes an amazing oil cleanser that smells heavily of heavenly jasmine!). Echinacea, dandelion and burdock root get down to business on your face — the business of detoxifying skin of impurities and preventing breakouts. This cleanser is way more expensive than what I prefer to pay, but like I said, it’s definitely a treat to use and feels oh-so-soft on the skin. I’d repurchase this with the In Fiore cleansing oil for a very luxurious few months of cleansing with the 4-2-4 method. This gentle, milky, creamy facial cleanser combines Siberian cedar nut oil with a blend of apple, burdock root and calendula to cleanse without stripping, all while tackling inflammation and healing fussy skin. The texture of this cleanser is a dream: not too thick and lotion like; not too runny. It’s like a souped-up serum that’s easy to spread and massage into the skin, leaving it soft, smooth and radiant. I like that it uses cold-pressed Siberian cedar nut, which is rich in antioxidants, vitamin E and essential fatty acids. The entire formulation of Lyeska’s Facial Cleanser is spot-on for fussy skin types: there’s enough moisture to keep it from leaving your skin feeling tight, but packed with beneficial extracts to keep skin breakout-free. The key one that gets my attention? Burdock root extract. Its antiseptic properties are excellent at taming acneic skin. It also helps treat skin issues such as rosacea and eczema, inhibits the growth of bacteria, reduces inflammation and heals wounds. Free of parabens, synthetic fragrances and gluten, M-61’s Brilliant Cleanse is dense, creamy and oh-so dreamy to massage into your face in the morning. Grapefruit extract provides natural sources of brightening vitamin C, while mandarin orange peel extract tones and soothes. It also contains some skin-beneficial acids, such as glycolic, salicylic, malic and lactic, to further refresh and renew the complexion. Thick, creamy and comforting, this cleansing milk pairs perfectly with a konjac sponge for a fresh morning cleanse. Organic evening primrose and jojoba oils replenish the skin while orange essential oil lifts the spirits. I love the feeling of this cleanser on my skin — it’s the perfect balance of creamy and indulgent, yet moves about very easily and rinses off like a dream. One of the most gentle daily exfoliating cleansers on the market, this cleanser takes advantage of Actifolate, a patented fungal extract that combines peptides with polysaccharides derived from cell wall components of the Mucor Miehei mushroom. This creates this cleanser’s signature irritation-free, intense exfoliation that feels finer than sand and leaves your skin feeling buffed and clean. Chamomile powder and manuka honey aid in calming and smoothing the skin with every wash. This is another one that’s on the pricey side, but if your skin needs regular, gentle exfoliation, you can easily just use this and skip the separate exfoliator. This dreamy cleanser keeps the skin’s protective acid mantle intact while carefully washing away impurities with white tea, argan and evening primrose oils. I love the perfect, creamy texture and delicate scents of lavender and carrot. Two or three pumps of cleanser is more than enough to massage in for a mini spa-at-home experience. A slippery, barely-foaming, gentle morning cleanser, Yuli Halcyon soothes and calms the skin without overly stripping it of natural oils yet provides a wonderful clean. If you want to get a little bit of foam, use it with a konjac sponge. However, by design, this is a non-foaming (but non-cream) cleanser that gets your skin back to basics with simple cleansing via hydrosols, herbs, peptides, vitamins and fruit enzymes. A change in its marketing would put Fig + Yarrow’s Cleansing Nectar into the positive for me. Presented as a washless cleanser and toner for gentle exfoliation, the Cleansing Nectar is under-performs in the cleansing department but excels in the toning department. Call me old-fashioned, but when I think cleanser, I think gel/foam/cream + water. I get the multipurpose idea behind this product, but just didn’t feel very clean using it as a cleanser. After cleansing with a different product and using the Cleansing Nectar as a toner, my skin and I felt happy. Perhaps look for this on an ultimate guide to toners instead. With a few updates, this face cleanser could be good. For starters, the packaging needs a change; it’s in a glass dropper bottle. Not the best delivery for a daily cleanser. Get this in a pump or pour-top and we’re almost there. Second, the organic peppermint and field mint essential oils, while at the end of the formula list, are overpowering and feel a little drying to the skin. With such a short, lovely ingredients list, these minty things can be too much. It definitely was for my skin. From a formulation standpoint, this cleansing lotion was just fine. It was the delivery that put Marula Pure Marula Cleansing Lotion on my “no thanks” list. Though it’s described as a cream cleanser, Meow Meow Tweet’s Face Cleanser is more watery and slippery, making it very difficult to effectively apply and massage into the skin. It’s better described as “an oil cleanser that rinses off” but without the oily consistency because of the witch hazel (ingredient No. 2). The thinness of it makes the essential oils in the formula a bit too strong for my skin. I would love to see this cleanser bulked up a bit for a better consistency to use either in my hands or with a konjac sponge. When I used it, I lost a lot of product because of the watery texture. Though extremely gentle and soothing, Narynda’s Skincare Cleanser’s milky, runny texture wasn’t quite to my liking. When applied to a konjac sponge and then massage over my face, I could keep the formula from running, but if I cleansed just with hands, the cleanser liked to run down my arm. The formula itself, as I said, is very gentle, and would be lovely for someone with dry skin or as the morning cleanse, but it just didn’t sit well with me in the texture department. With a mix of citrus oils, grapefruit seed extract and apple cider vinegar, Nonie of Beveryly Hills’ cleanser was a bit too tingly for my skin. Though it’s in a base of coconut and almond oil and has a lovely, lotion-like texture, I found the citrus oils a bit too irritating on my facial skin. I’d use this with a konjac sponge to get a good morning cleanse, but decided to instead focus more of the cleanse on my T-zone and under the chin, which seems to be able to handle the natural alpha hydroxy acids a little better than my cheeks. Designed for combination to oily skin, Acure Organics’ Facial Cleansing Gel gently washes away the day’s grime and helps remove any additional makeup that your first cleanse left behind. Antioxidant-rich acai, blackberry, rosehips and pomegranate make this affordable cleanser an obvious repurchase — there’s a lot of clean, botanical ingredients packed into these four ounces! I love that this is a true gel formula (not slippery or watery), and if you’re a cleansing brush kind of person, you can easily use this with your device of choice. If you have acne-prone skin that needs some help a few times a week, this 10% AHA cleanser belongs in your arsenal. In addition to glycolic acid, this face wash contains fruit-based actives to help keep skin bright and beautiful. Be mindful how often — and when — you use this product, though. I find it’s great for an evening routine that will be followed by lots of moisture and hydration. Use this too much and your skin will feel tight and dry. Use it a couple times a week before and during your cycle, and you’ll be able to better control some pesky breakouts! Handcrafted in Minnesota from raw clover honey, vegetable glycerin and organic castile soap, Hum’s Honey Face Wash is one that I have been reaching for again and again. Remember that whole “be careful with castile soap” thing? Hum gets it right by balancing sudsy, cleansing castile soap with a generous amount of raw honey to keep this cleanser equal parts moisturizing and cleansing. Dare I say it may be one of my favorite affordable cleansers to date. Anything that’s labeled as a blemish-clearing product gets attention from me, and Juice Beauty’s Blemish Clearing Cleanser delivers. Extremely affordable and easily accessible, this cleanser deep cleans thanks to organic lemon, cherry and aloe juices. Your skin is never left feeling stripped or tight, and your breakouts calm a bit with regular use. The pump top bottle is also extremely convenient. This scentless, weightless cleanser combines organic aloe vera juice, fruit extracts, and plant oils for a gentle, moisturizing wash that lightly foams and leaves the skin feeling soft and clean. The formula includes medicinal herbs such as spikenard, Spanish marjoram and meadowsweet flower to help combat inflammation and deep clean the skin. I’m taken by just how gentle yet effective this formula is. It’s easy to use both morning and night if you just want one cleanser. I almost didn’t include this exfoliating cleanser in this roundup because it plays such a dual skincare role, but it does fit within the “cleanser” category quite well. At first massage into the skin, the Refining Sugar Cleanser feels 100 percent like an exfoliating scrub. Tiny sugar particles get to work sloughing away dead skin cells as the cleanser begins to lightly foam up for a deeper clean. As this happens, the sugar basically disintegrates and you’re left with what feels like a traditional foam cleanser. A light, sweet, vanilla scent makes the multitasking cleansing experience absolutely scrumptious. I absolutely adore this cleanser. Its scent, packaging, cleansing action and price make it a home run in my book. Seriously, when I heard that my spa may not carry it anymore, I nearly had a cow (I hate having to order a bunch of stuff online if I can easily pop into a local store and buy it there instead!). The Cleanser’s beautiful blend of active, certified organic ingredients cleanse, calm and nourish the skin. The chamomile is extremely soothing, and I like that this formula contains extra virgin olive oil (an ingredient that tends to go in and out of vogue in green skincare, but to me, is a classic). ilike is a Hungarian spa skincare brand that brings the best herbs, extracts and more into its formulations — thus, the high pricetag. While I’m not going to be forking over $68 for a cleanser anytime soon, I did enjoy the experience of using Refreshing Mint Exfoliating Wash. It reminds me of Noxema — in a good way — thanks to the peppermint and eucalyptus. While I typically steer clear of minty face products, which can irritate my skin, ilike’s formula has a great balance of base ingredients that keep the potency of the minty ingredients subdued. This cleansing gel contains tiny, non-abrasive natural exfoliating beads for a deeper cleanse that never irritates. Usually, I’m not a fan of cleansers with these little exfoliating beads, but these don’t bother me. Jurlique’s gel has wonderful slip, making it easy to use very little to get a lot of cleansing action. Ingredients like yarrow and witch hazel address problematic skin while lemon balm and rosemary help address oil. This cleanser is a win for both day and night because of how gentle it really is. While it’s not the most botanically based cleanser on the list, m-61’s Power Cleanse Pore-Purifying Glycolic Face Cleanser gets a spot on my repurchase list because of how relatively clean it is (no ingredient scores higher than “4” on the EWG Skin Deep Database) and how fantastically effective it is at deep cleaning acne-prone skin. This intense glycolic-based face cleanser is free of synthetic fragrances and includes tea tree and vitamin B5 to help treat acne and soothe irritation. The star ingredient, glycolic acid, works well my my combo-oily acne-prone skin to remove dead surface skin cells and deep clean, both treating and preventing breakouts. I like to use this cleanser the week before and week of my period to keep my hormonal acne in check. With just two pumps, Mukti’s Balancing Foaming Cleanser, a gel that creates a very gentle lather, cleanses your skin and keeps it in balance. After a wash, the skin is never tight, thanks to an extremely hydrating base of aloe leaf juice and calming ingredients such as calendula and chamomile. This cleanser is lovely to use both morning and night. It’s gentle enough for a quick morning cleanse in the shower (which I usually reserve for cream cleansers), and strong enough to use after makeup removal at night (which is when I usually use my foaming or gel cleansers). This is the perfect hybrid cleanser for combination/oily skin, and it has a slight citrus smell thanks to pink grapefruit and mandarin. I finished the travel size of this cleanser so quickly thanks to its perfect gel texture and easy squeeze-tube packaging. The full size is packaged in a pump, and SMB Essentials is a perfect example of what’s on the inside really counting. I don’t find the packaging and design to be anything quite beautiful, but the ingredients and performance are fantastic for getting that nice, gel lather that’s compatible with a konjac sponge or fingers. Though Amaranth Gentle Cleanse is formulated for normal to dry skin, I found that my combo/oily skin responded very well to it and did not feel stripped or unclean with regular use. This gel-based, gently foaming clay cleanser purifies and tones without leaving my skin feeling tight or dry. The texture is very interesting — a bit jelly, but thicker thanks to French green clay. It’s scented with jasmine, frankincense and sandalwood for a deeply comforting, grounded floral that’s a tad herbacious and 100 percent beautiful. I like to use this cleanser at night, but think it’s gentle enough for a quick morning cleanse, too. This foaming gel cleanser gives my skin a thorough cleanse and my senses a happy, brightening effect. Yes, my senses. Made with cedar, spearmint and lime, Ursa Major’s Fantastic Face Wash makes you feel invigorated without overly stimulating your skin or your mind. The spearmint top notes of this wash give a bit of tingle without setting your face on fire the way many minty washes can. The inclusion of rosemary, vetiver and lavender gives this face wash amazing depth in both scent and treatment. There’s some fantastic skin-brightening, deep-cleansing and mind-calming effects in this cleanser that I recommend for both men and women. Also, because the gel is nice and dense, a dime-sized amount is all you need for a perfect wash. This was my go-to cleanser for use with my Clarisonic Mia. Yours Truly Organics’ Take it Away Gel Cleanser had a dense gel texture that took well to the brush head, keeping a nice, thick layer of protection between the sonic speed bristles and my skin. When used with just hands and water, it’s difficult to really massage this cleanser in, so I recommend using it with a brush head or a konjac sponge. With its instant burst of foaming goodness, 100% Pure’s Jasmine Green Tea Cleanser gently washes away the day without drying the skin — a tough feat for a true foaming cleanser. This is because 100% Pure’s cleanser leaves out harsh detergents and instead uses a mild coconut cleanser infused with lavender honey, green tea, berries and jasmine. For a jasmine addict like me, though, this cleanser really doesn’t smell like anything at all. But that can be good for those of you with sensitive noses and skin! Instead, it’s basically scentless save for a mild green tea scent. Though this is made for normal to dry skin, it’s basically fine for any skin type (including my combo/oily skin). It’s not on my repurchase list because, well, I kinda bought it because I wanted a jasmine cleanser. Also, it contains Japanese Honeysuckle extract as a preservative, so if you’re avoiding that ingredient, be aware. Fragrance- and sulfate-free, this gel cleanser would be perfect if it had a few more moisturizing ingredients. Post-cleanse, my face is a little bit dry (but not completely tight and uncomfortable). The base of aloe vera helps with this, but the formulation is missing key oils (like olive or sunflower) that can help keep skin feeling soft. Designed for oily and acne-prone skin, Desert Essence’s Thoroughly Clean Face Wash contains old faithful tea tree and lavender to treat and prevent breakouts while offering a nice lather in a base of castile soap. Be very mindful of how your skin feels with this wash, as the castile soap can be a bit stripping without additional moisturizing ingredients (your skin should not feel tight after cleansing!). This triple-action organic face cleanser is designed to remove makeup, exfoliate and purify the skin. While it’s good at all three of those (my skin felt super-clean after using it! ), it’s too stripping, even for my combination-oily skin. I’m not quite sure why that is, as the ingredients list is packed full of nourishing oils, but my skin just did not agree with this cleanser. Can’t win ’em all, I guess. Made with raw honey, glycerin and an infusion of cherry oil with calendula, ginger, roses and enzymes, this gentle gel cleanser targets acne but keeps the skin from feeling stripped. I wanted to love this cleanser — the low foam was extremely gentle and deep-cleaning — but the herbs and other ingredients left a bit of an after-scent and after-taste if I got it on my lips. Call it user error if you will, but I just couldn’t handle the herbal after effects. This is a great budget buy and extremely accessible (think drugstores and mass retailers). I like that the pump releases an instant burst of foam — but this cleanser ended up being a little too drying for my skin. In the beginning, it seemed to be compatible with my skin, but after continued use, my face felt tight and itchy after use. Bummer. This paraben-free detoxifying cleanser is formulated with charcoal to draw out impurities and has a dose of tomato extract for a shot of antioxidants. Jojoba spheres help gently exfoliate, and salicylic acid deep cleans pores and prevents future breakouts. However, it’s not on my repurchase list for two reasons: 1) I’m not a fan of the slippery texture and 2) I can’t handle the scent, which is somewhat perfumed (fragrance is on the ingredients list). This could be a real winner if the scent were more subtle.